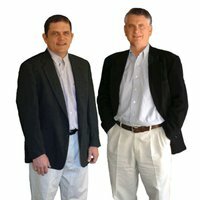 We frequently get asked the question “how much cash flow can you make with a mobile home park?” or “how many lots do I have to own to make $60,000 per year after the note payment?” These questions are a little like “how many shingles does it take to cover a roof?” – it is completely based upon the size and type of deal that you buy. But here is a very basic analysis. 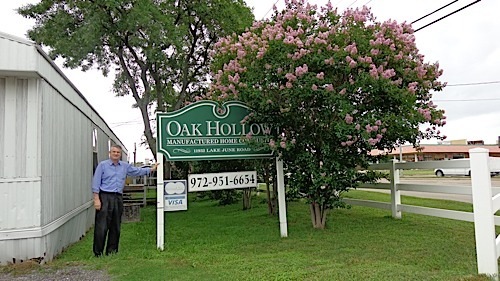 If you buy a mobile home park at around a 10% cap rate, and assuming interest rates of 5% to 6%, then the park can, at closing, carry the note (including principal and interest) and provide maybe 20% return on your down payment. What creates the cash flow that people are mostly interested in is what you do after closing to enhance the performance. Let’s assume, for example, that you buy a 50 space park in which the lot rent is $100 per month below market. So, after closing, you raise the rent to market (giving the correct notices, of course). That one maneuver is going to create 50 x $100 x 12 = $60,000 per year of cash flow. If the rents can’t be raised at all, maybe the plan is to fire the manager earning $50,000 per year and to replace them with a manager at $20,000 per year – there’s a $30,000 cash flow enhancement to you. The bottom line is that you need to buy a mobile home park at a price that supports the note (including room for reasonable repairs, etc.) and then focus on the upside of what you do to improve the financial performance – that’s your real cash flow. Of course, to many people, the return on the down payment is the primary goal (cash-on-cash return). But if your plan to is replace your day job, then the upside is a key part of your puzzle, and the upside potential will give you the answer to the cash flow answer. The top drivers of this “cash flow enhancement” are raising rents, replacing the manager, cutting other costs, pushing back water and sewer cost to the tenants, filling vacant homes, and increasing occupancy. 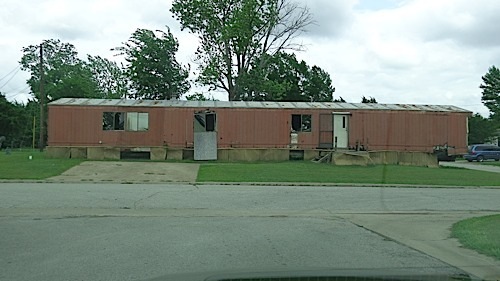 We recently purchased a mobile home park in Arnold, Missouri that was, at one time, a premier property. When it was built around 1952, it was immaculate and the homes were new and the yards manicured. The residents had jobs and careers, and drove nice cars. The entry was attractive, and there were never any police calls or code violations. Today, while some of those tenants still remain (probably about half the park), the aesthetics are atrocious, and the city required us to post a bond just to get a clean bill of health for the loan. So how do you bring a park back from the brink of death, and make it a nice place to live and a good money maker? How do you perform mobile home park CPR? The first step is to let the world know what the plan is --that you are reclaiming the park and making it the nicest place in town again! This will let the good tenants know to “hang in there, help is on the way” and the bad tenants know that “the days of wild partying, not paying rent, and living like scum is over.” It also lets the city know that “happiness is around the corner” and the neighbors know that “don’t worry, the problem is being fixed.” You can’t tell enough people – there is no downside, only upside to this public relations blitz. I’ve even given articles to the local newspaper about it in some towns. You can’t expect people to fix up their property until the park itself take the lead on the reclamation. All the common areas – the parts the park owns and controls – should be mowed, edged, round-up sprayed, painted, free of any debris. If the roads need work, get it started. This type of behavior is infectious – the tenants will immediately respond by following your lead. The first impression of a park is key. Your sign should be stellar. White vinyl fencing and some native plants (that don’t require irrigation) can make an ugly entry look like a country club. Make every resident, inspector, lender and appraiser think “wow, this park looks great” upon seeing your entry. And don’t forget to maybe put a banner out there talking about move-in specials or homes for sale. Does the park have park-owned homes that come with it? Then get the exteriors fixed up now (you can do the interiors later). Every home should have a minimum standard on the exterior of no broken windows or doors, no rotted siding, decent paint job with a decent color, and vinyl skirting (or something at least attractive). The lots should have all debris removed and the yards immaculate. Sure the floors may be missing inside – you can get that remodeled later. Get every tenant a new lease and rules, and then go after the ones that don’t follow the rules. Be relentless. The goal is to get them in order or out of the park. If you lose some tenants over the “no big dog” or “no home without skirting” rules, then so be it. Once you kick out a couple of them, the rest will normally get the message. 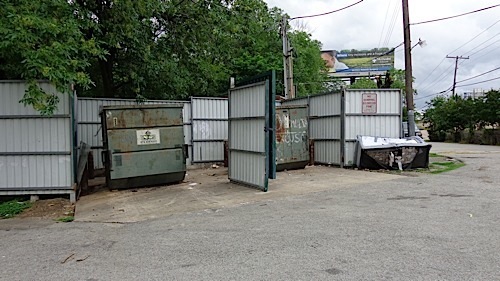 Remember that it only takes one nasty house and yard to ruin the lifestyle quality of the rest of the neighbors – plus it defeats your message of “cleaning up the park”. You control the park, not the tenants. If they won’t do what you want, then no-renew their lease and get them out. When you look at the rent roll and the amounts owed, you immediately see a correlation between the nice tenants paying on time and the bad tenants with big balances. A great way to get rid of the tenants you don’t want is simply to demand that they pay or get evicted. We call this policy “no pay/no stay” and the attack plan is simple: you either pay the rent in full or you’re gone. No payment plans. No mercy. You’re out on the street. This policy will eradicate the problem tenants faster than non-renewing leases, and will weed out the tenants who really can’t afford to live there. When you buy a park that needs CPR, you initially may have an action plan with 100 items that need to be fixed and addressed. Over time, this list will dwindle. Keep reviewing and marking off items, and focus on attacking what’s left. Don’t get a warm fuzzy feeling because you have half the list done, and that you can slow down. You must continue to the end. It’s a great feeling when you narrow the list down to the final “top 10”. But your job is not done until the list is at zero. Nothing is worse for a park than vacant homes. It scares potential tenants, and it attracts drifters and vandals. Get the home renovated and sold as fast as you can. Of course, you can’t do them all at one time. But try and triage them so that you do the easiest ones first, and get them filled to get the rent going as well as humans in those trailers. Once you turn around a mobile home park, the #1 goal should be to never let it get that way again. However, I have many times driven by parks that the owner got perfect, and then let them go down the drain again. It’s easy to do. How many people have undergone a diet – lost 10 pounds – and then gained it all back later. If you have lost the interest to keep the park up, then sell it before you let it go down again. There’s no excuse to let a park get run down. Make sure you have the controls in place to manage the manager, to monitor the drivers to profitability, and to see the park first-hand periodically. CPR on a park is no different than CPR on a person. You have to move fast, and you have to proactively work the important issues first, and come back to the lesser later. Unlike saving a person, however, there are huge financial rewards to saving a park – and just about as big a sense of accomplishment. Sure, you won’t be able to say “I saved someone’s life”, but you will be able to say “I improved many people’s lives” – and that’s a great feeling. 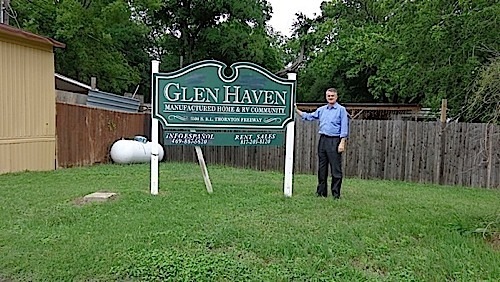 I was in Dallas a few days ago – to look at a park we’re buying – and I had the chance to visit two of my old properties that were nearby. The first was my very first park, Glenhaven. Not much has changed there since the days when I sat in the old trailer/office from 9 to 5 for about a year. 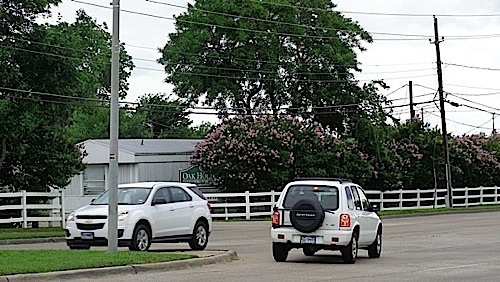 I also drove by Oak Hollow, the property I bought that was next to a Walmart. I was amazed at how great the park was looking – mostly thanks to the incredible barrier plan I came up with back then. The park was so ugly, when I bought it, that you felt like you should just put a giant sack over it to protect the scenic beauty of those who drove down the street. So to mask its lack of appeal, I designed a scenic buffer to block the view and give it great drive-up appeal. 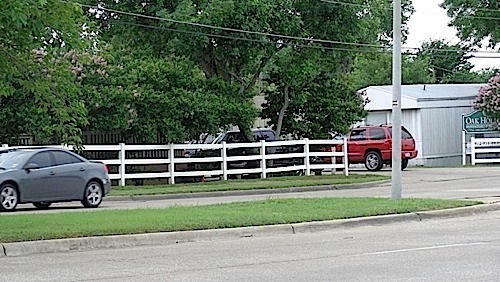 It was my experimental project of combining three-rail white vinyl fence with native trees that require no irrigation – in this case, crepe myrtles. We planted around 100 of them, and only about 3 or 4 died after the first summer, and that was with no watering other than the rain. As you can see, with virtually no maintenance, the scenic buffer has just become better with age. Is That Dog Heading To Our Mobile Home Park? New Court rulings and Federal laws are opening the door to allow a parade of dogs and other animals onto your property. In many instances, either the Americans with Disabilities Act (ADA) or the Fair Housing Act (FHA) give your tenants the right to keep a dog or other pet even though your community rules would otherwise prohibit such. Disabled people may request that they be allowed to keep "service animals" and "emotional support animals." Presuming the tenant and animal meet the proper definitions, community management must allow the animal to stay. A "service animal" is defined as a dog that is trained to do work or perform tasks for a person with a disability. "Emotional Support Animals" are broadly defined as any animals, whether trained or not, which provide emotional support and alleviate symptoms of a disability. 5) discriminate based on the perceived severity of a disability. For example, you can't allow accommodations for a quadriplegic in a wheel chair while not allowing accommodations to another who has no readily visible disability. 4) require that every tenant seeking an exception complete and sign the "Service Animal from Tenant to Management Affirmation" found in the "Loss Control" section of our website www.MobileAgency.com. This letter requires the tenant to make specific affirmations and provide verifications from third parties that the animal is a "service animal" or "emotional support animal." The verification should be from a "Health Care Provider" in the case of an emotional support animal. The definition of a "Health Care Provider" isn't limited to a medical doctor. This is a quick article on a complicated topic, so be sure to visit with your own counsel for more specific questions. Though the law has taken away some of your authority to limit tenant animal ownership, you do retain some authority to manage these animals. Using the "Service Animal from Tenant to Management Affirmation" letter will give pause to those tenants that would bring in pets that aren't truly support animals and would otherwise not be allowed. And knowing you don't have to allow a dangerous pit bull to reside in your community is a comforting thing.